Stir together 6 cups Rice Chex cereal and 2 cups whole nuts in a 13 X 9 pan. Melt 1/4 cup butter and 1/2 cup brown sugar, and 1/2 cup of Savannah Almond, Hazelnut, Cinnamon or Praline Mix. Heat until boiling, then simmer for two minutes. Add 1/2 teaspoon baking soda and stir until foamy. Pour mixture over cereal and nuts and stir to coat well. Bake at 250 for one hour, stiring mixture once. Remove from oven and spread on a cookie sheet to cool. For a sweet and spicy version of this recipe, add cayenne pepper to taste to liquid mixture prior to boiling. Ladies, this is super easy to make, and everyone loved it! Delicious at Christmas or any other time of the year! 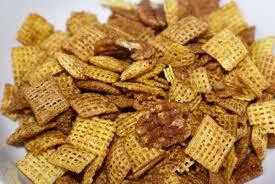 Savannah Praline Crunch Mix… Use Pecans for the nuts. Savannah Almond Crunch Mix… Use whole almonds for the nuts. This is a great recipe…we have added M&M’s, cocktail peanuts, mixed nuts, candy corn, popcorn and pretzels to this mix…just use your imagination, and please let us know your favorite versions! Thanks a million for sending this recipe. I’m anxious to try it.